In the Executive MBA Americas program, coaching is an integral part of our learning culture and its importance cannot be overstated. In addition to your team Coach, you will have the support of an Executive Coach, Career Coach and Lifestyle Coach while in the program. Today, people at all levels of management are using executive coaches to help them achieve their full potential. The optional Executive Coaching program will help you gain a better understanding of yourself and how to fully leverage your strengths. The impact of your Executive Coaching experience can be immeasurable and will affect many aspects of your life, both professionally and personally. 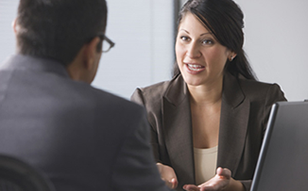 It is very important to develop a good rapport and chemistry with your Executive Coach. For this reason, you are able to choose from our roster of coaches. Our professionally trained coaches have a wealth of work, life and coaching experience, ensuring that the process is highly impactful and responsive to your needs. Executive Coaching can take many directions and, at Smith School of Business, you are empowered to influence the direction you wish to take. Many participants choose to focus on identifying and leveraging their personal strengths, and our coaches have several innovative personal assessment tools at their disposal to assist you in this process. Other participants choose to focus on identifying and mitigating any perceived weakness, while still others choose to work on specific personal or interpersonal issues they may be experiencing. In short, the opportunities are practically limitless. "I was aware of the Executive Coaching option when I enrolled in the program, but I really had no idea what an impact it could have. I was able to choose my Executive Coach from a roster of coaches and really influence the process. As a result, I feel I have a much better understanding of my strengths and how to leverage them." "This program has a real coaching culture. They surround you with an amazing support system that includes a Team Coach, an Executive Coach, a Lifestyle Coach and a Career Coach. I don't think this level of support exists in other programs." In today's competitive business environment, just having the right skills may not be enough. A key ingredient in the recipe for career success is focused, strategic career management. We have developed one of the most comprehensive approaches to career management available anywhere, including one-on-one career coaching and an online suite of career management services that you may complete at your own pace, according to your own goals. Fit to Lead™ is an optional program that focuses on mental, emotional and physical well-being. Topics covered include personal reflection, goal setting, fitness, healthy eating and achieving work-life balance. Within this context, fit to Lead™ focuses on the importance of making your own personal choices, challenging yourself to live a balanced life, and welcoming change. During the program you have an opportunity to take part in various team and individual activities and learn how to live a healthy, balanced life. You will have access to a Lifestyle Coach who will work with you to design a personalized fitness plan. Throughout the program, Fit to Lead™ will continue to inspire you. Group challenges, newsletters and the lifestyle planner keep you involved while our staff will work to help you succeed. "Fit to Lead™ was the hidden gem of my MBA experience. It provided great advice on lifestyle, diet and fitness. That’s one of the great things about this Executive MBA program. It goes well beyond the academic content and looks to help you improve yourself on so many levels."